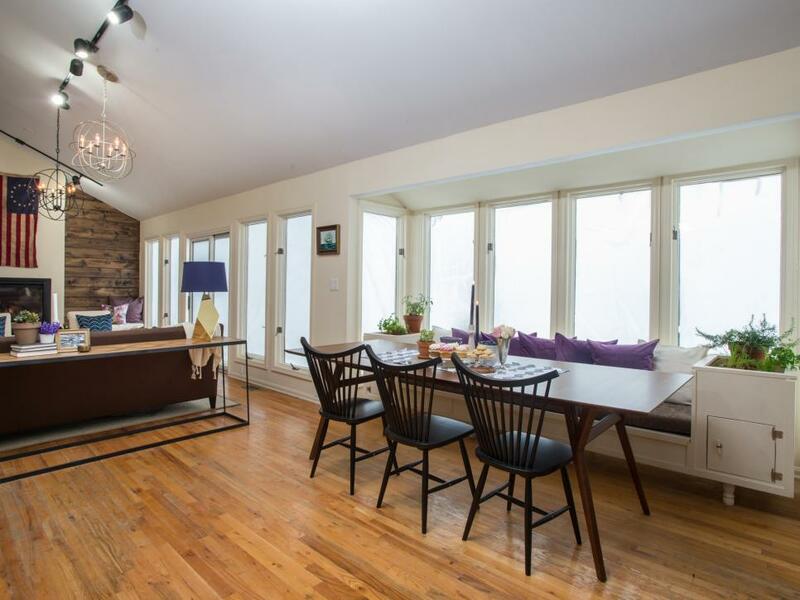 The new family room in features exposed beams, as seen on HGTV's Restored by the Fords. 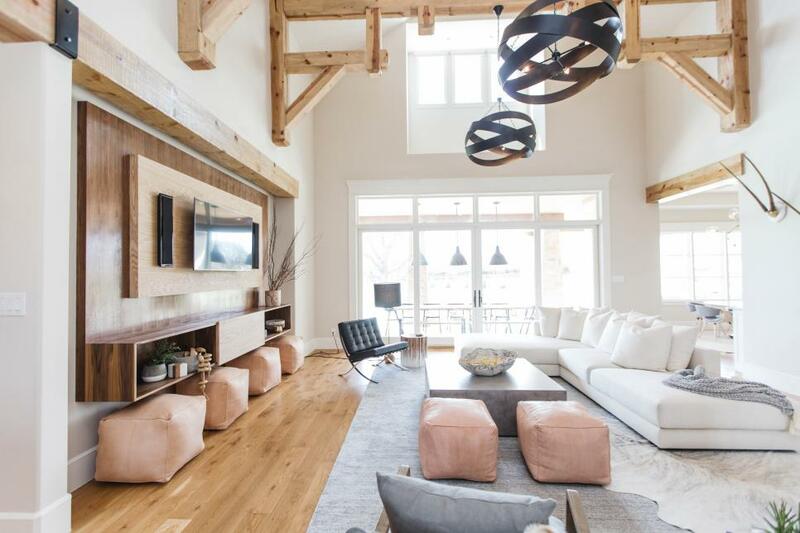 This contemporary great room incorporates the open kitchen's eat-in island and features wide-plank wood flooring as well as a movable wall leading to the pool. 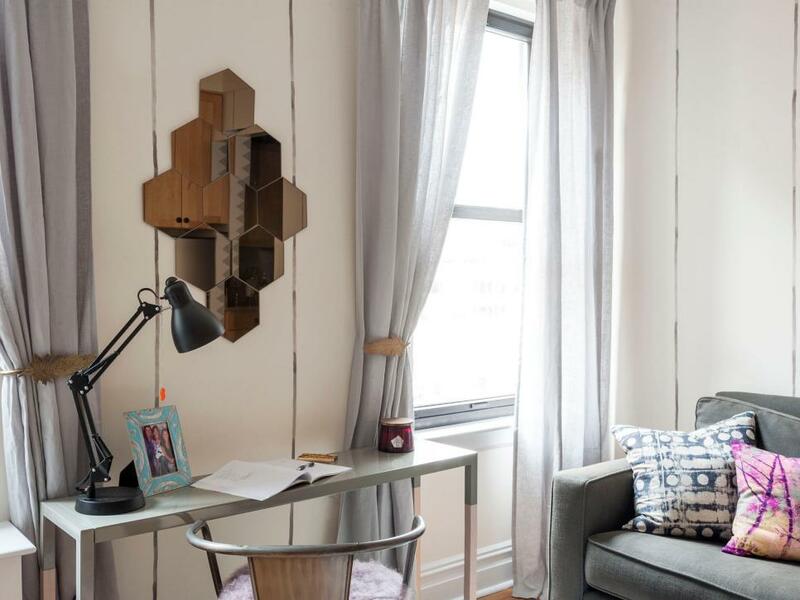 This small rented studio on Manhattan's Upper West Side is short on space but long on style. A Blu Dot for Target console table does triple duty as a vanity, workspace and dining table. The pinstriped wall paint treatment is both easy to produce and easy to cover up, an ideal combo for a rental. Hexagonal mirrors from IKEA add an artistic yet inexpensive element between the windows. The living room is contemporary but casual and relaxed. 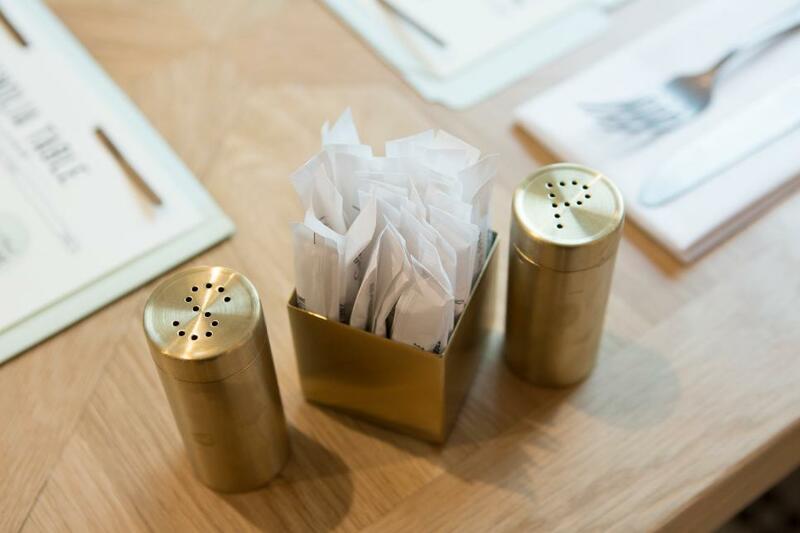 The space is open so the cook can talk to guests while preparing meals. 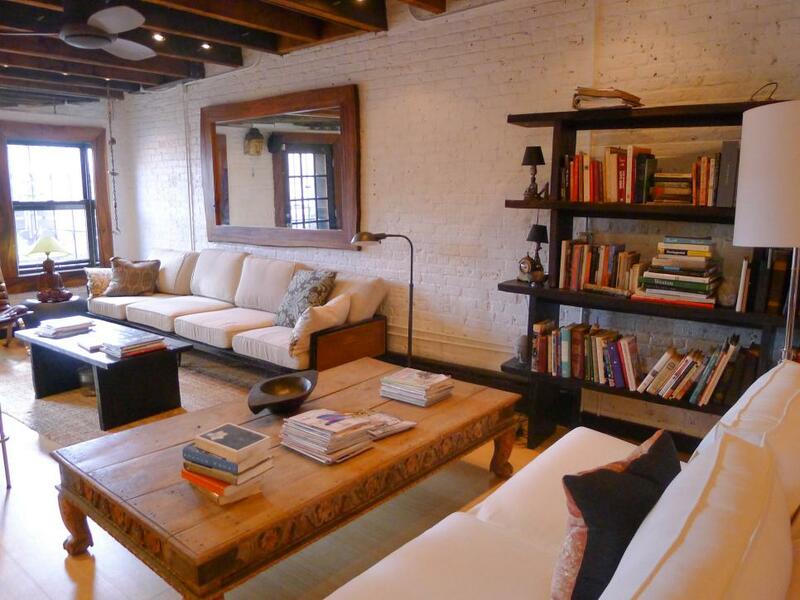 Reclaimed wood furnishings warm up the space in contrast to the painted brick. 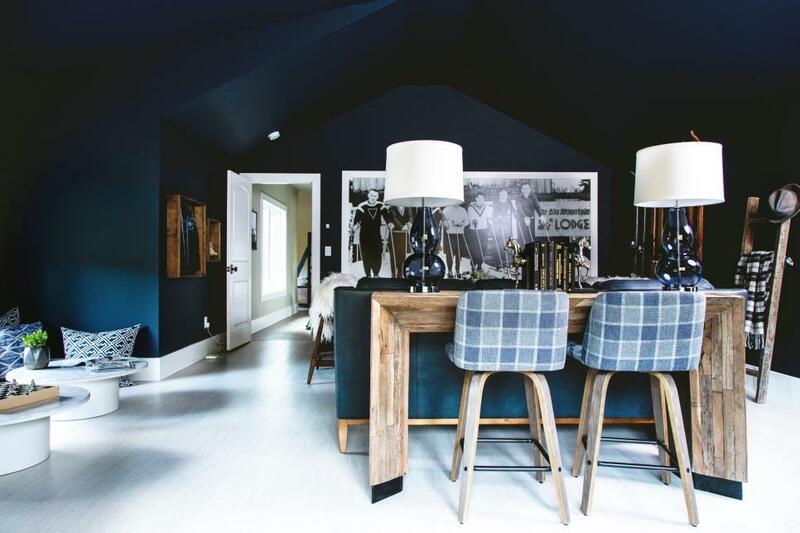 The designers of this morning room started with a simple black-and-white color scheme, then added visual interest by mixing patterns and textures. 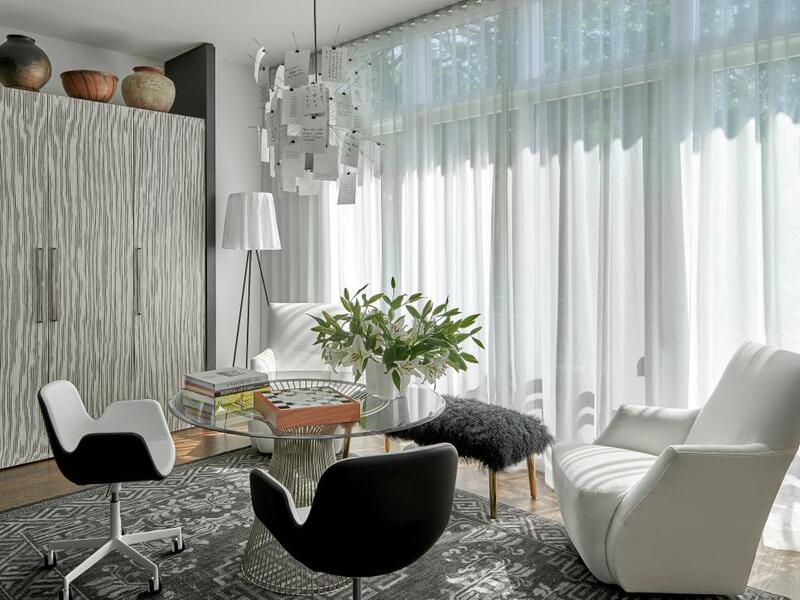 Sleek contemporary furnishings bring a lightness to the space. 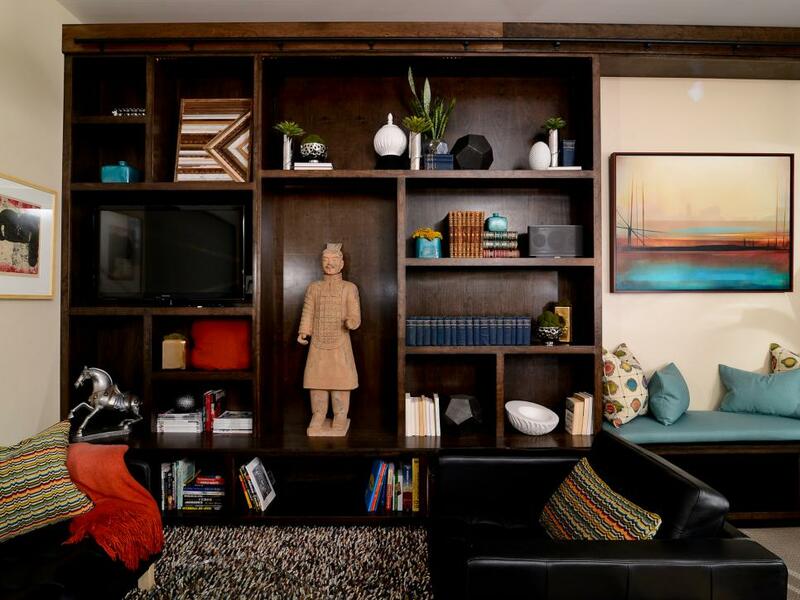 A built-in bookcase spanning the length of a wall adds character to this cozy living room. The bookcase offers extra storage as well as extra seating via an integrated bench. An extension of the kitchen, the living area is stylish and comfortable with kid-friendly surfaces and a mix of textures. Color is brought in via pops of blue and orange (love those barstools and stove!). 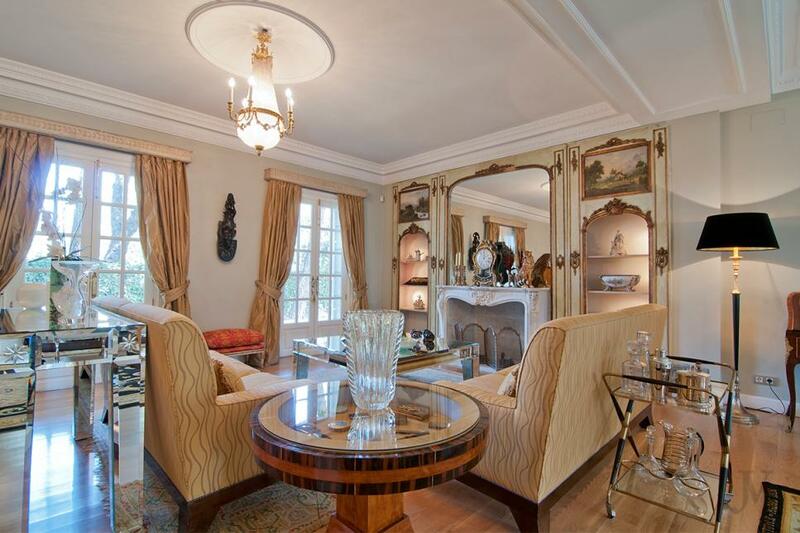 Creams and golds fill the elegant living room, punctuated by crisp accents of black. 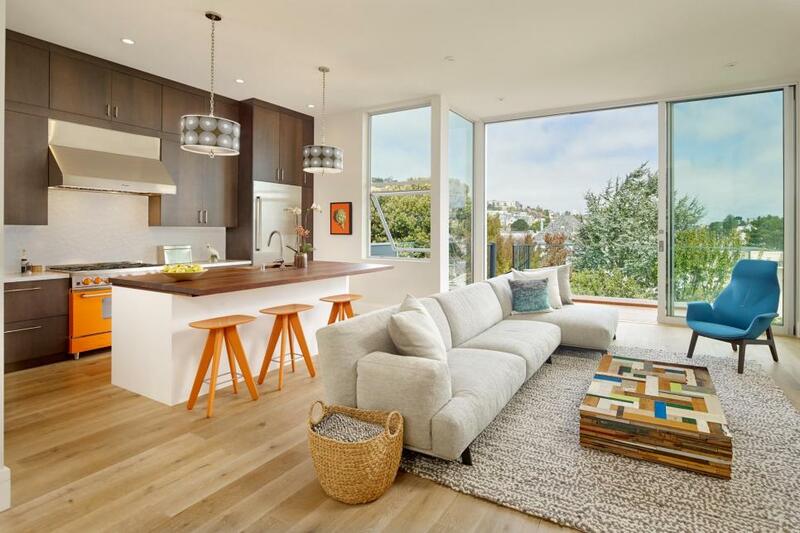 High ceilings add to the airy feel of the space. 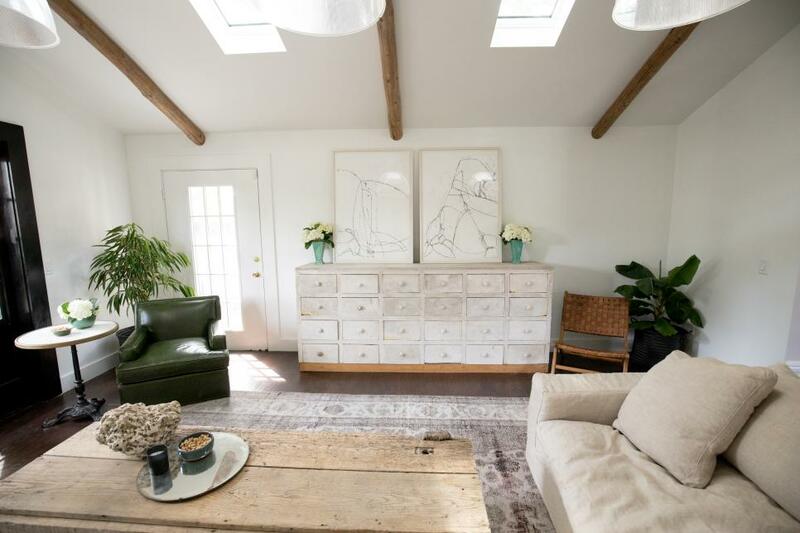 This is a space where the client goes to sit and read to her youngest son, curl up in a chair near the fire or have guests over for a glass of wine. 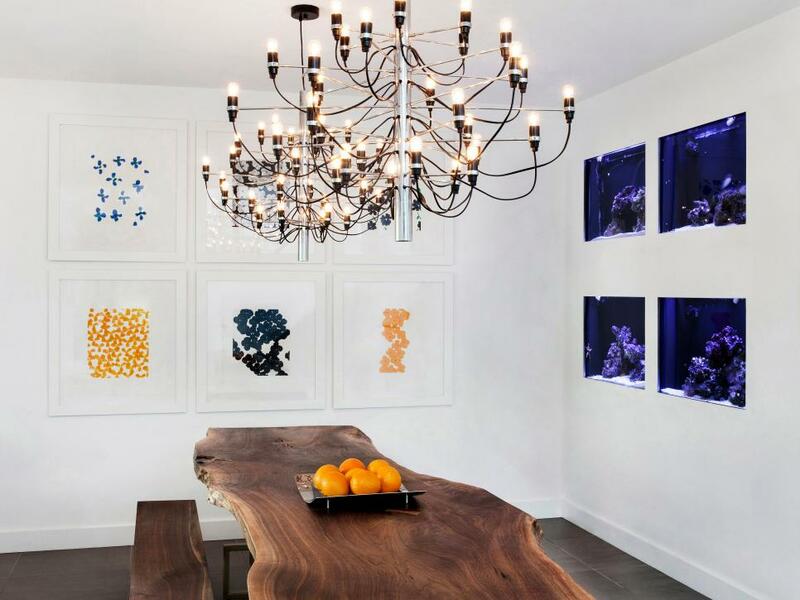 The room was designed to feel approachable and comfortable, but luxurious and playful. 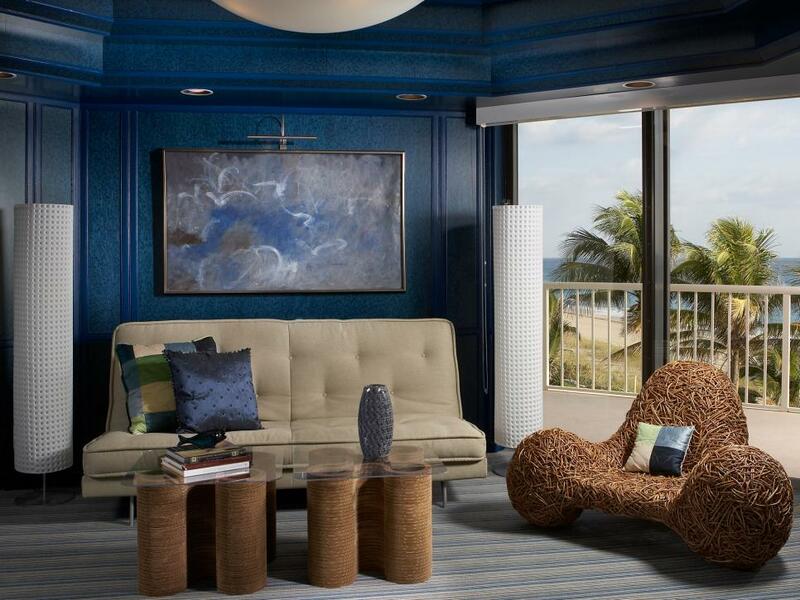 A living room with oceanfront views incorporates elements of the sea into its design. 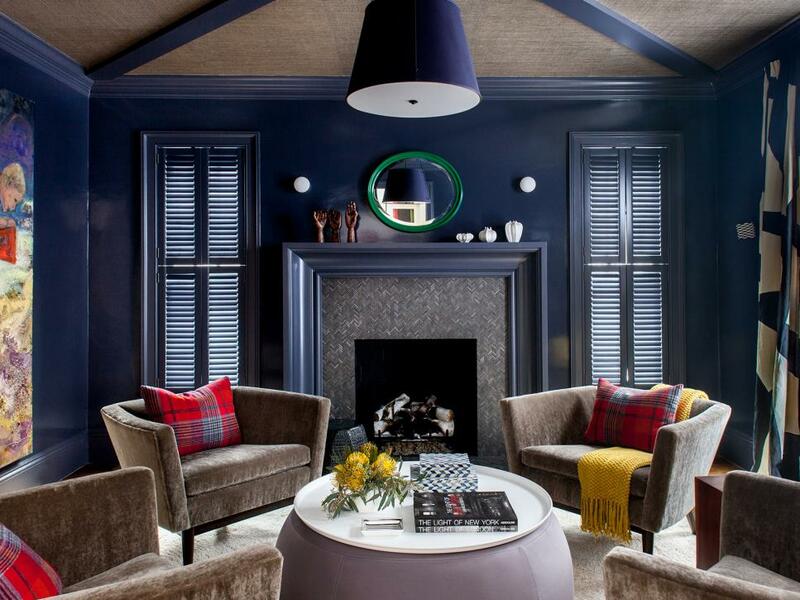 Dark blue walls are paired with a sand-colored sofa, while a unique wicker chair and coffee table contribute natural texture. 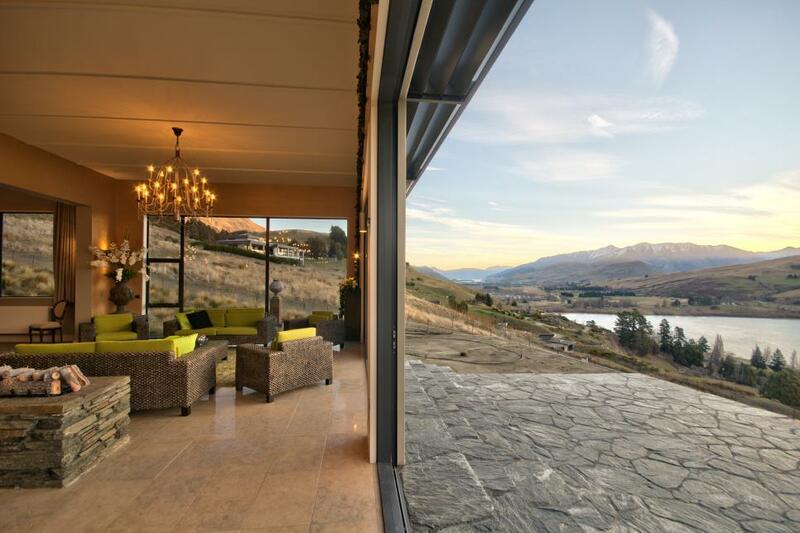 Fantastic views of Lake Hayes and the surrounding area are put on full display from the indoor-outdoor sitting room. Casual wicker furnishings pair with bright green cushions for a comfy conversation spot to take in the views, and a delicate chandelier hangs above to add a touch of elegance. 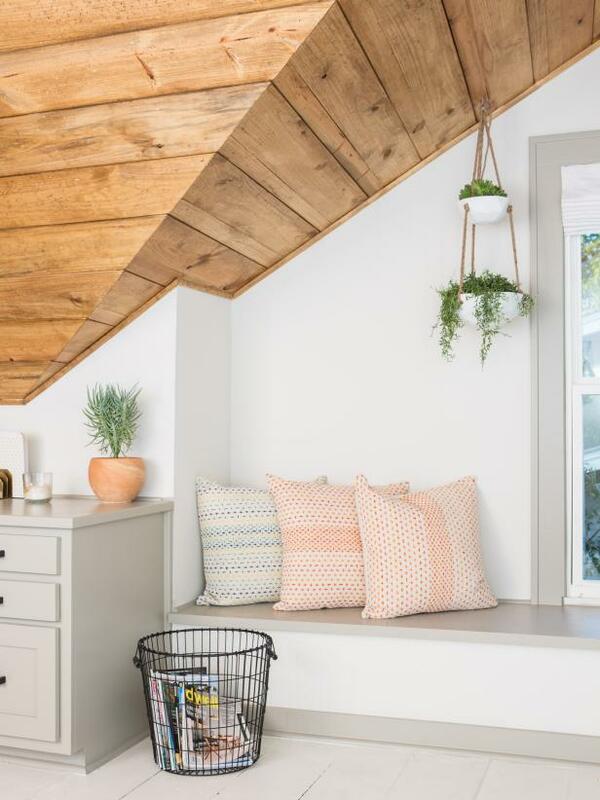 The dominant palette in this sitting area is full of cool colors: gray and white. 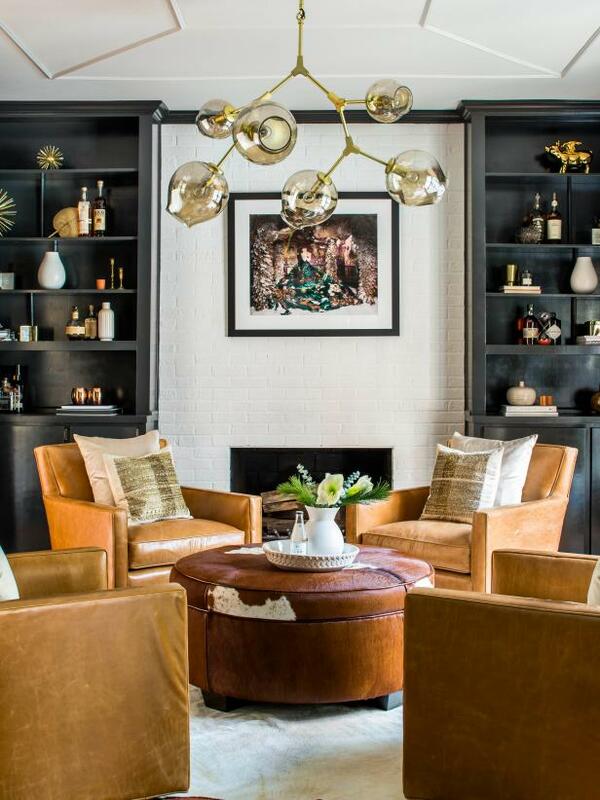 So to add an infusion of warmth, the designers selected brown leather armchairs, a cowhide ottoman and brass chandelier.